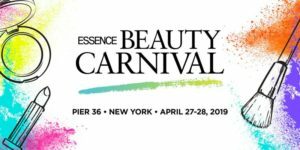 Essence Beauty Carnival™ is a one-of-a-kind three-stop destination event for makeup superfans, hair chameleons and every woman in between. Bring in the Bold! From live tutorials to curated shops, explore a vivid spectacle of global beauty at Pier 36 in New York City! BEAUTY STAGE LIVE! – Grab a front-row seat to real-time demos, beauty chats and more with your fav beauty gurus! Be a VIP at the Beauty Carnival VIP tickets offer access to the VIP- an exclusive destination at the Essence Beauty Carnival™ – complete with pampering stations, meet & greets, and more! Plus, take home a limited-edition tote filled with must-have products! Limited quantity of tickets are available in each market! Visit essence.com/beautycarnival for more information! *Tickets are non-refundable and non-exchangeable after purchase.